Identification of language resources in existent pools and in other national resources based on pre-identified user needs. Make these Language Resources practically usable through offering different entry points and proposing criteria and methodologies for their benchmarking and qualitative improvement. Identify national language strategies and policies as well as funding resources to realise the Multilingual Digital Single Market. Foster cooperation across stakeholders through targeted dialogue events, to define a practical MT deployment roadmap for the future of Europe’s Multilingual landscape. 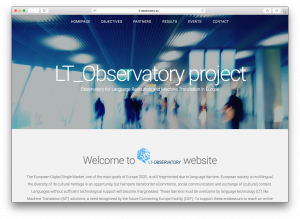 Create the on-line LT-Observatory as a sustainable infrastructure for access to the “LT-Ecosystem” tools and resources. For more information please visit www.lt-observatory.eu. Blanca Rodriguez ZABALA Innovation Consulting, S.A. This project has received funding from the European Union’s Horizon 2020 research and innovation programme under grant agreement no. 644583.